If you’re sick of archaic, ancient looking old coffeemakers that look clunky and old-fashioned on your stylish kitchen counter, look no further than a sleek, minimal and beautifully designed Farberware Coffee Maker. These coffeemakers have been designed to have a beautiful brushed stainless steel finish with a minimal design. The Farberware is also known for it’s great price point, as well as it’s flawless design. 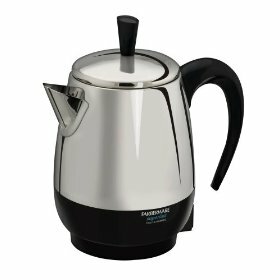 What all Farberware coffeemakers have in common is that it has a 24-hour programmable timer and clock, so you can program to have your coffee start brewing at a regular interval throughout the week, or even multiple times in one day. This makes the Farberware coffeemaker ideal for those days when you can’t manage to pull yourself out of bed until you get a whiff of fresh, brewing coffee wafting through the air. Best of all, if you’re the kind who likes just a couple of sips to get you going through your morning routine before you settle down at your desk in the morning with a big mug of Joe, then no worries – you can interrupt the Faberware coffeemaker mid-brew to get your fill, and then leave the Faberware to continue on brewing. This is also ideal for those who have an early wake-up time, and want to leave coffee for their roommates or loved ones who they live with. The Farberware coffeemaker is also remarkably easy to clean – just some paper towel, warm water and vinegar and you’re good to go for regular cleaning and maintenance. Most Farberware coffeemakers tend to be lightweight, making them ideal for transportation. As well, unlike your typical delicate glass carafe, you no longer have to worry about chipping or breaking the carafe while washing it or putting it into the dishwasher – the stainless steel is virtually impossible to damage. There are all kinds of different variations on the Farberware model – some with different brewing capabilities, some which can brew more coffee faster, less coffee faster, some cordless, and many more features. Ideally, it all comes down to what you look for and value in your coffeemaker. Something that makes your morning routine a little easier? A little quicker? It all comes down to what you’re looking to add to your own individual coffee routine. The Farberware is one coffeemaker that truly handles it all, with a stylish look to boot. We know that you’ll absolutely love whichever Farberware coffeemaker you choose to go with.